Woohoo! The first new pattern in a long time! More exclamation points!!! The process of designing and perfecting a sweater pattern is long. But it’s pretty satisfying in the end. 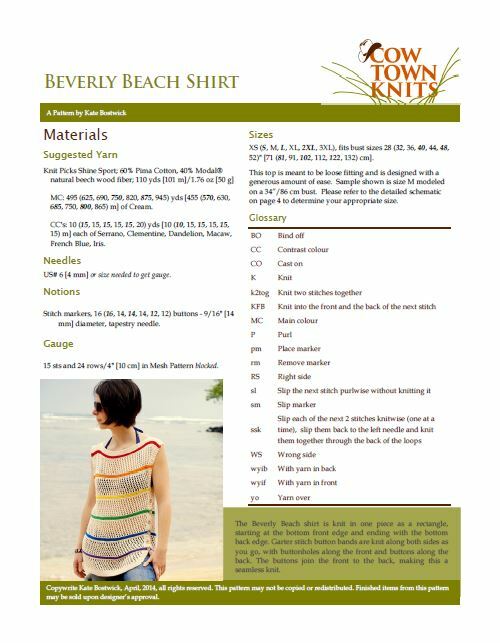 The Beverly Beach shirt is knit in one piece as a rectangle, starting at the bottom front edge and ending with the bottom back edge. Garter stitch button bands are knit along both sides as you go, with buttonholes along the front and buttons along the back. The buttons join the front to the back, making this a seamless knit. Sizes: XS (S, M, L, XL, 2XL, 3XL), fits bust sizes 28 (32, 36, 40, 44, 48, 52)” [71 (81, 91, 102, 112, 122, 132) cm]. This top is meant to be loose fitting and is designed with a generous amount of ease. Sample shown is size M modeled on a 34”/86 cm bust. Please refer to the detailed schematic in the pattern to determine your appropriate size. The release of this pattern also marks the debut of my new pattern layout. Check out the front page and tell me what you think!